A new and unique bedside device for children who don't want to wear an alarm. This new alarm comes with a wide range of options to awaken a deeply sleeping child. 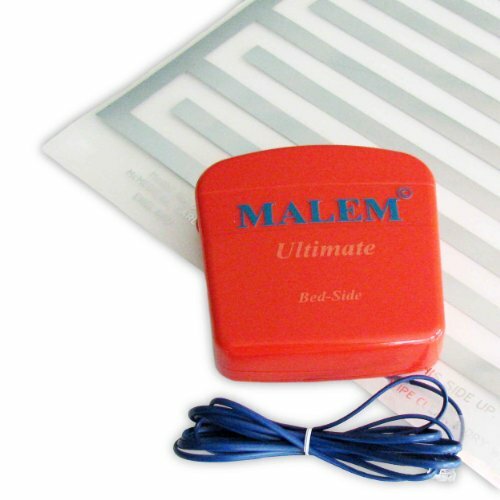 An embossed plastic moisture sensing bed pad is placed under the child and the alarm sounds when the pads sensor strips detect moisture. The pad should be placed under a draw sheet, or inside a pillow case. The bed mat is attached to the battery powered alarm unit by a 7 foot cord that does not disturb the user in bed. The alarm box is approximately 5.25x5.25x1.25". The 21 inch by 15 1/2 inch bed mat can be easily cleaned and dried. The alarm unit has a wide range of sound options that allow you to pick one that optimally meets your needs. You are no longer limited to just one tone chosen by the manufacturer. You have a choice of 8 built in tones or a custom sound you record yourself! The alarm has a variable volume control and flashing light that permits parents and children to locate the unit in a dark room. Optional 15 meter extension sound unit allows parents to hear unit and assist from far away. Must be purchased separately. If you have any questions about this product by Malem, contact us by completing and submitting the form below. If you are looking for a specif part number, please include it with your message.